I know having attendants is old fashioned. Most brides have their bridesmaids, and that’s it. But I have four lovely nieces that I wanted to include. 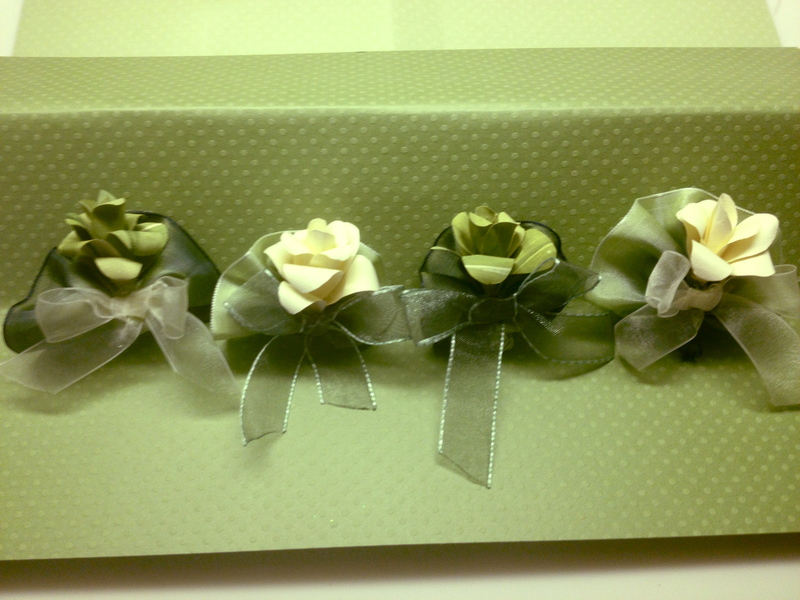 They each have a small duty (e.g., guest book, flowers, cord presentation, and dinner MC). 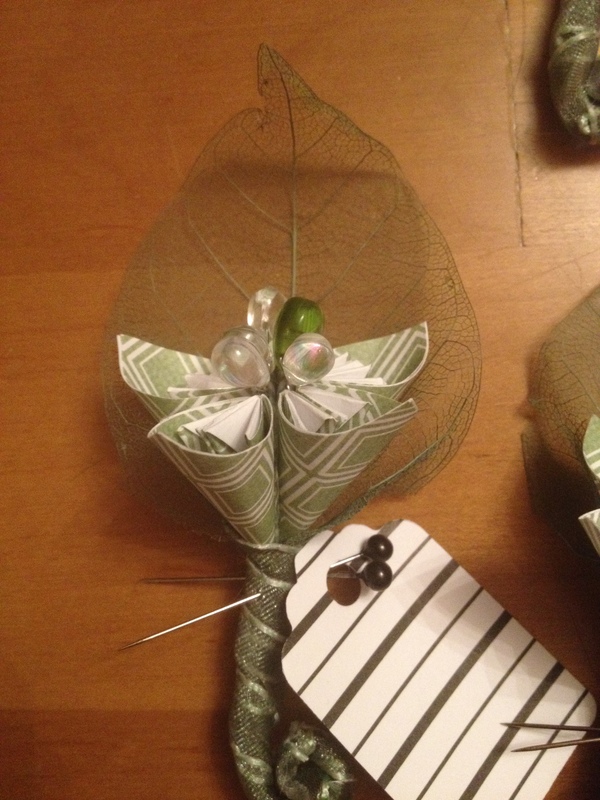 Once I finished the boutonnieres for the groomsmen and ushers, I wanted a corsage pin for the lovely ladies. 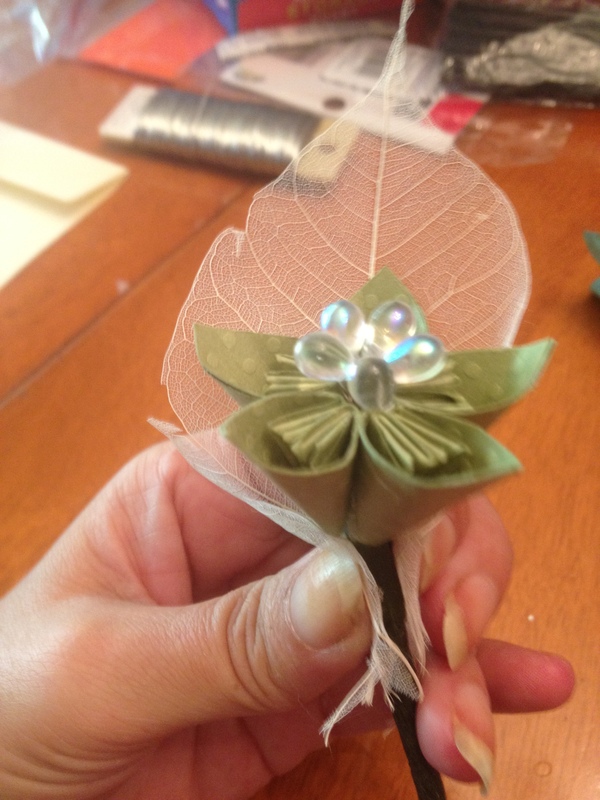 I have two kinds of paper flowers as decor for our wedding, painted rose-like flowers (soft and organic) and the kusudama origami flowers (more structured). 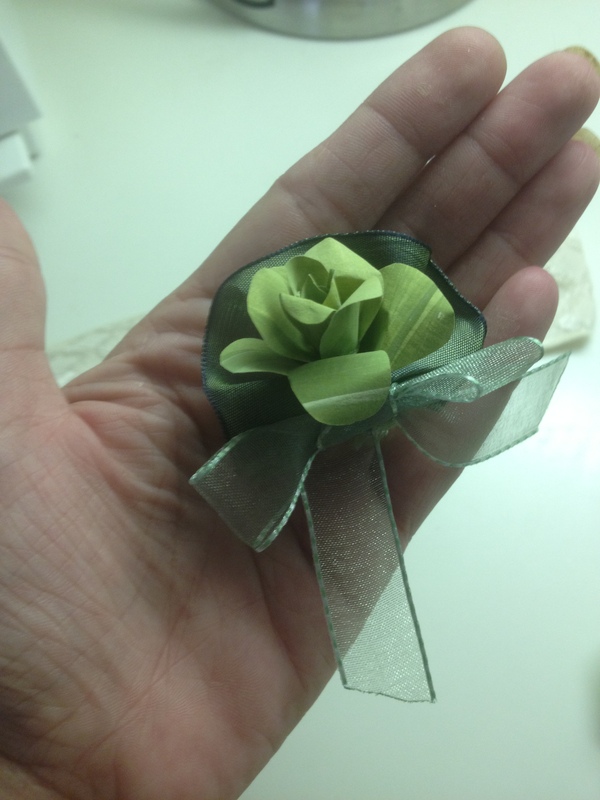 The men got the kusudama flowers on their bouts, so that leaves little tiny versions of my painted paper roses for the ladies. 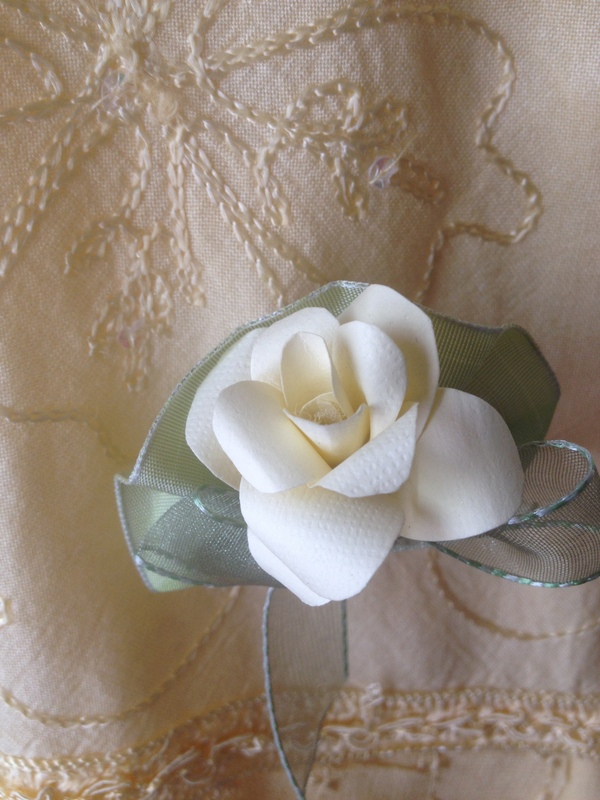 The giant (or even large) corsage was out given their taste, so I made these small pins for them to wear to show their special status in the wedding. 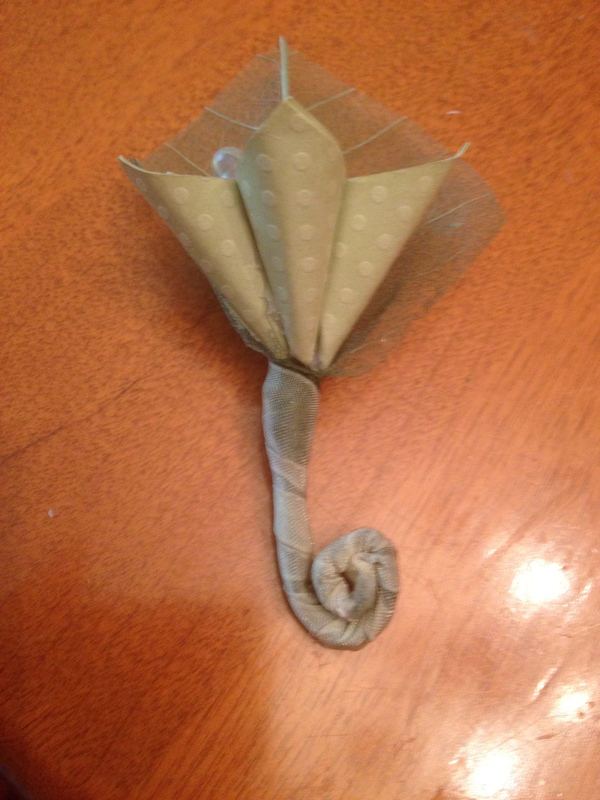 The instructions are a bit long since I included how to make the little rose flower. 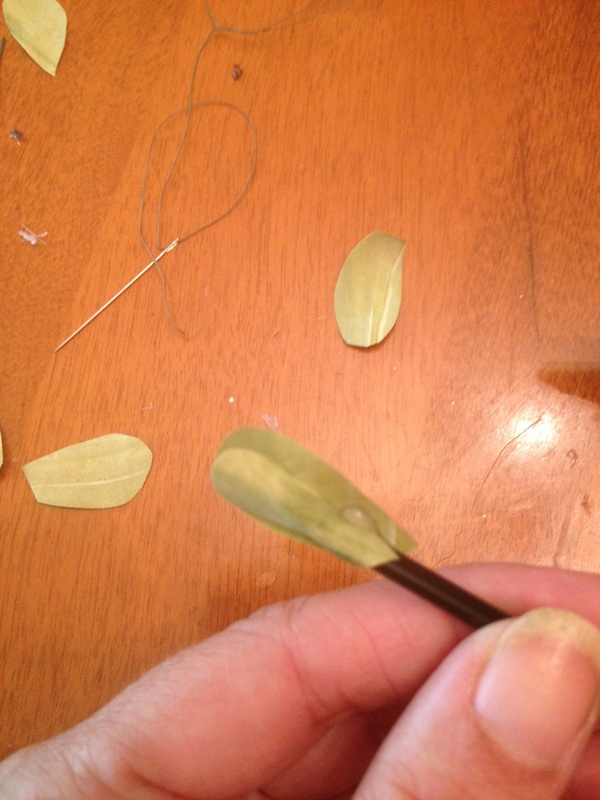 Paper cut into little tear drop shapes (about .5 to 1″ long). 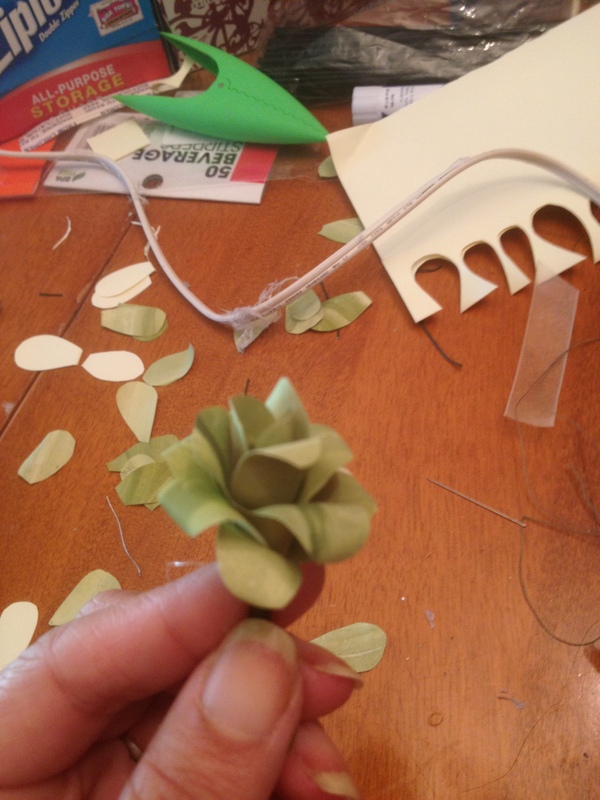 Optional–Paint a piece of paper first and then cut out the little petals (or use patterned paper). Regular copy/printer paper will work or slightly heavier, but not card stock. 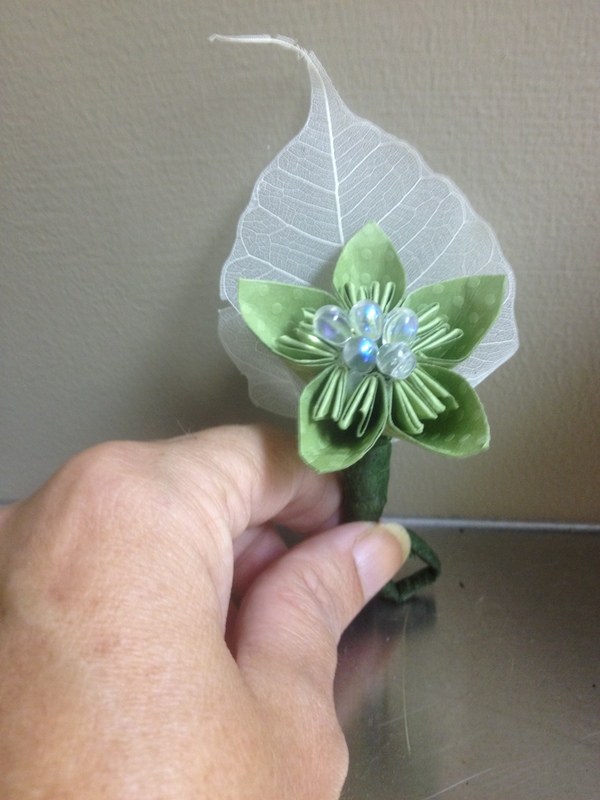 This is just a tiny version of my large painted paper flowers I previously presented. 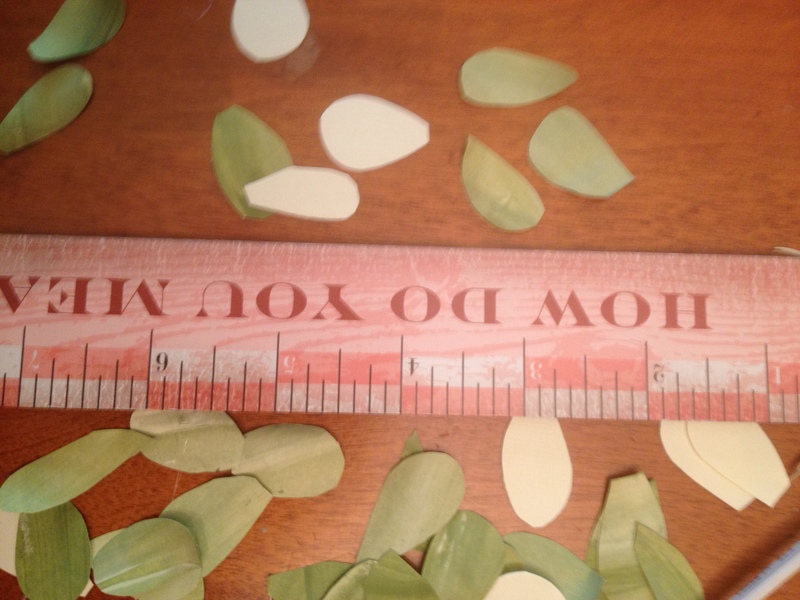 Step 1: Cut out about a dozen tear-drop shaped petal from your paper about 1″ long and in various widths (.3 to 1″ wide at top). 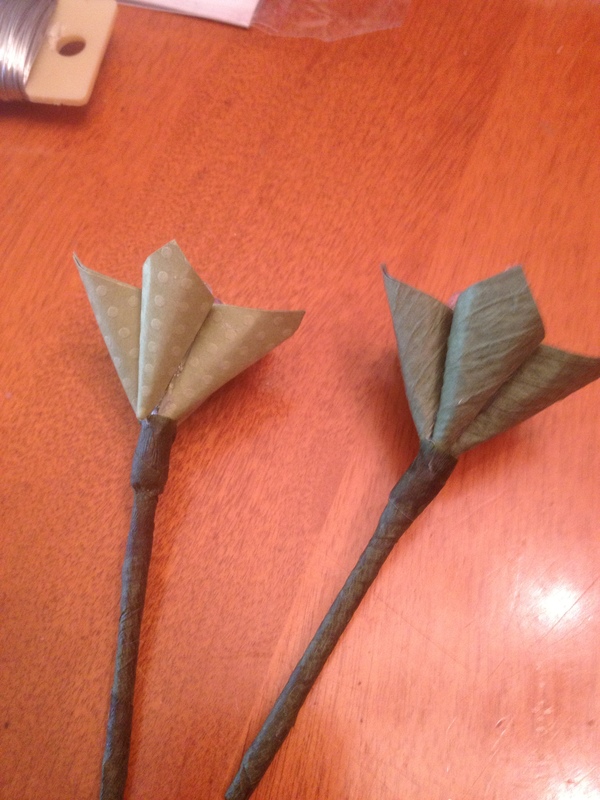 Starting with the “skinny” petals, dab some hot glue on the pointy (small) end and adhere to the tip of your cocktail straw. 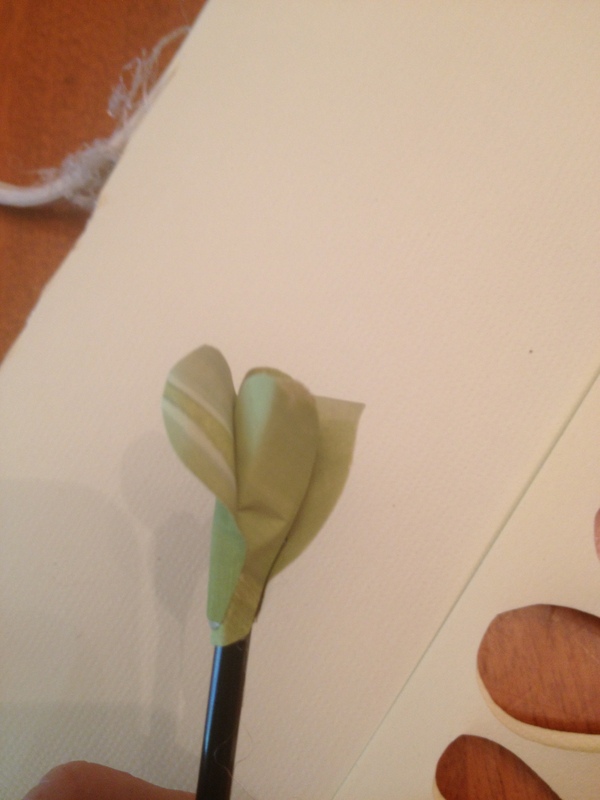 Shape the petal by gently bending it inwards towards the straw. Glue another one opposite of the first petal. 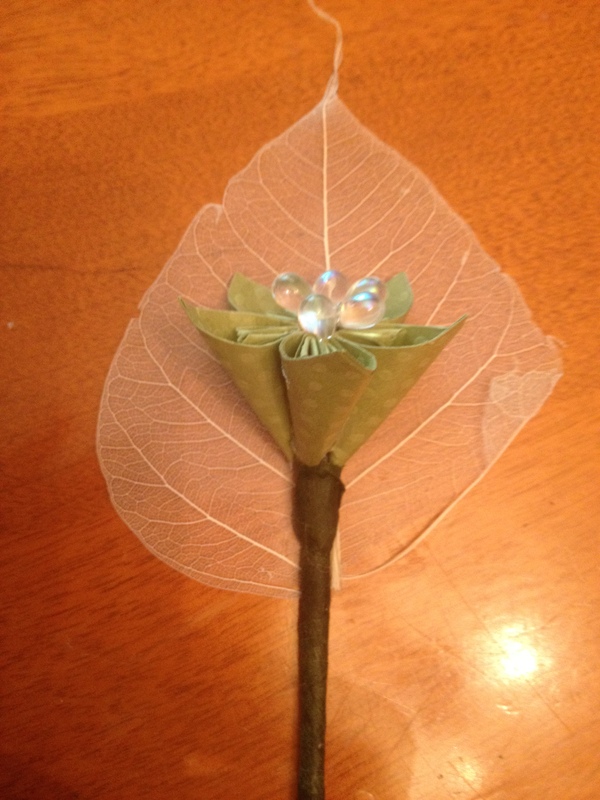 With a scrap piece of paper, roll it up and glue in the center of your two glued petals. 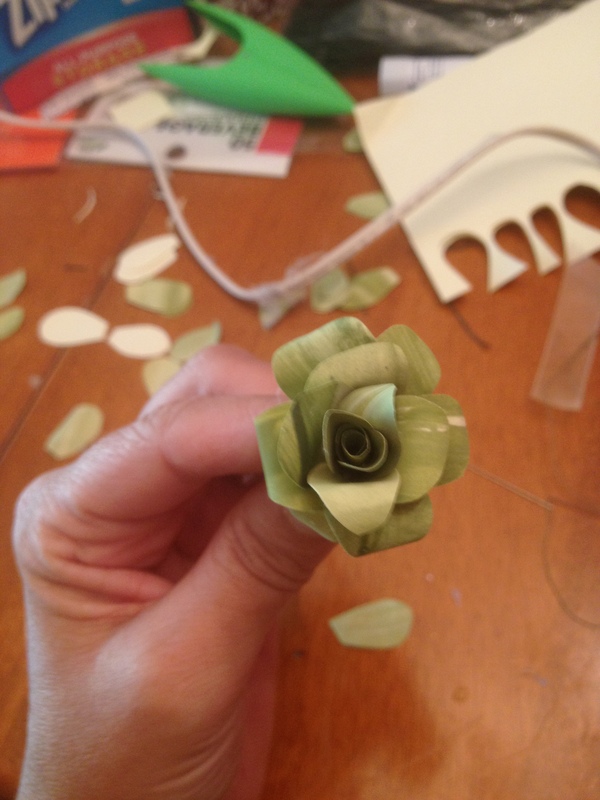 The center of your flower is complete. 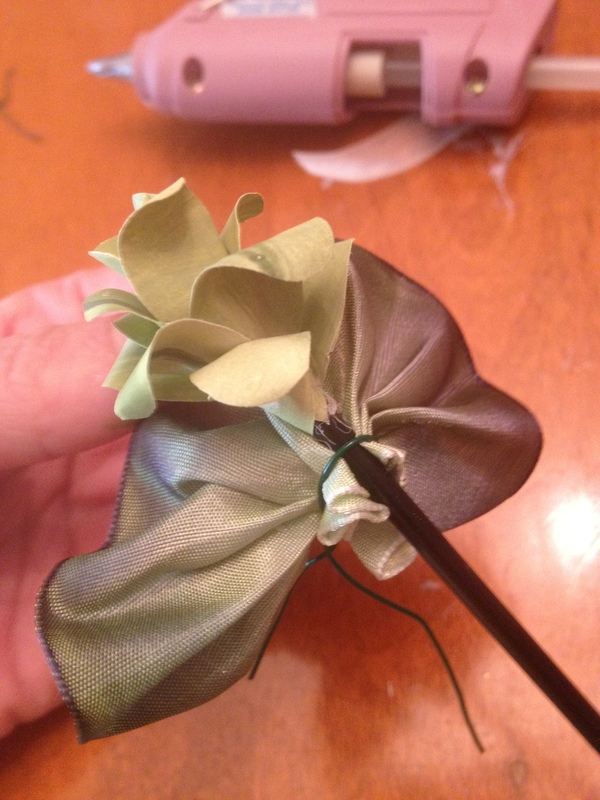 Step 2: Continue adding petals and shaping going around the tip of straw. 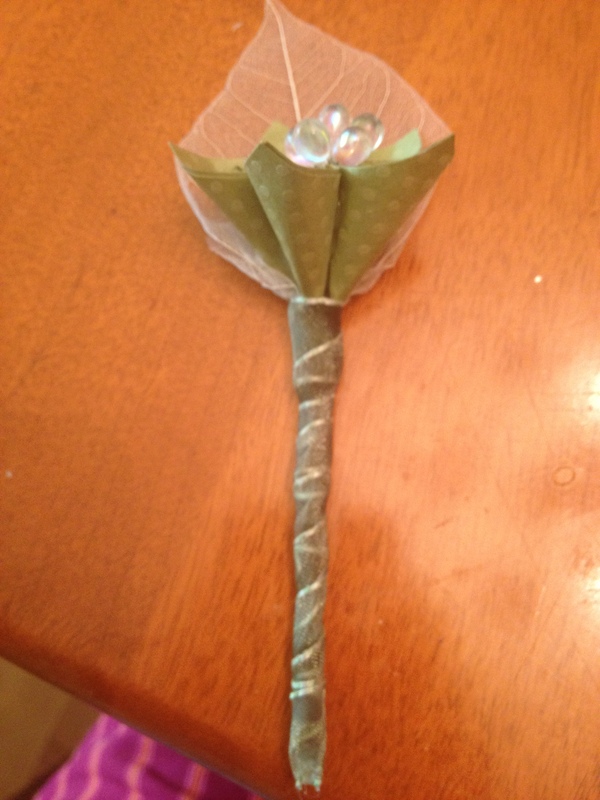 Use wider petals as you work your way to the outside of the flower. 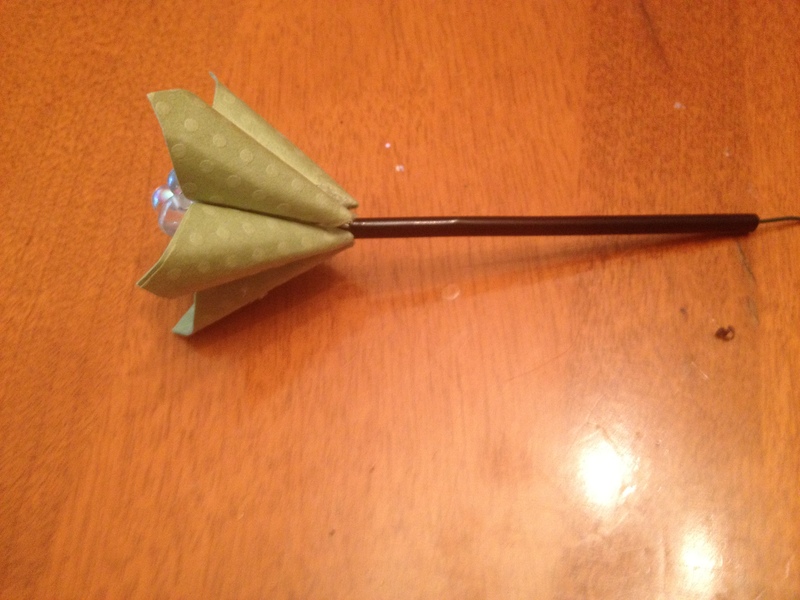 I use a small skewer stick to gently roll the tips of the petals as I go. Keep going until you like the looks of it. Put it aside. 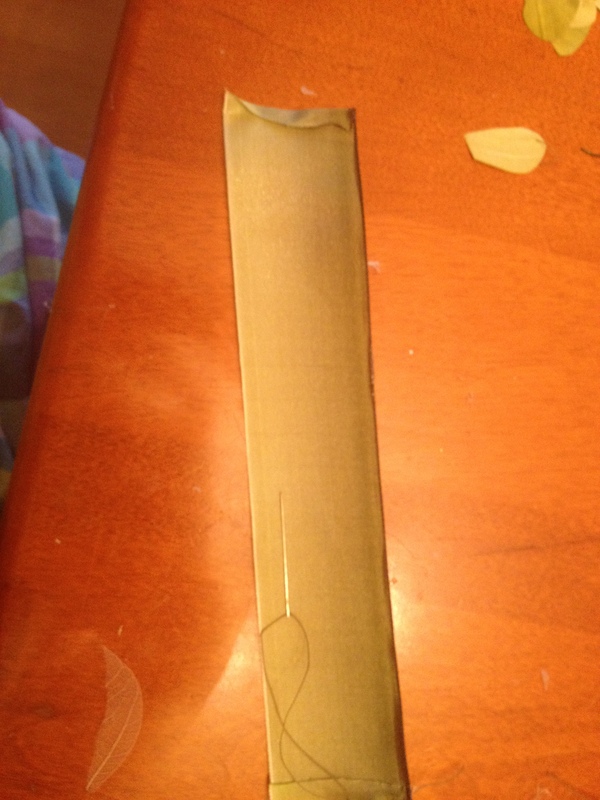 Step 1: Cut a piece of your wide ribbon about 8″ long. 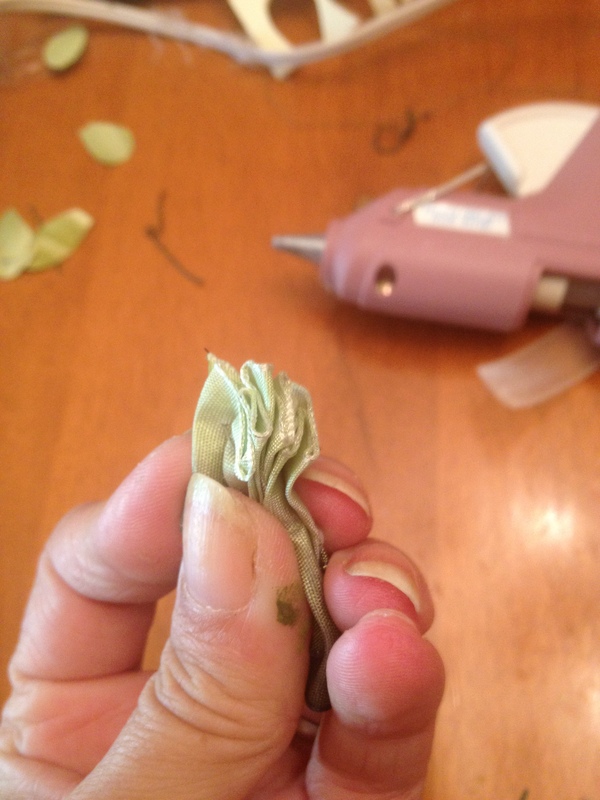 Fold over the ends and glue them down to give it a finished edge. 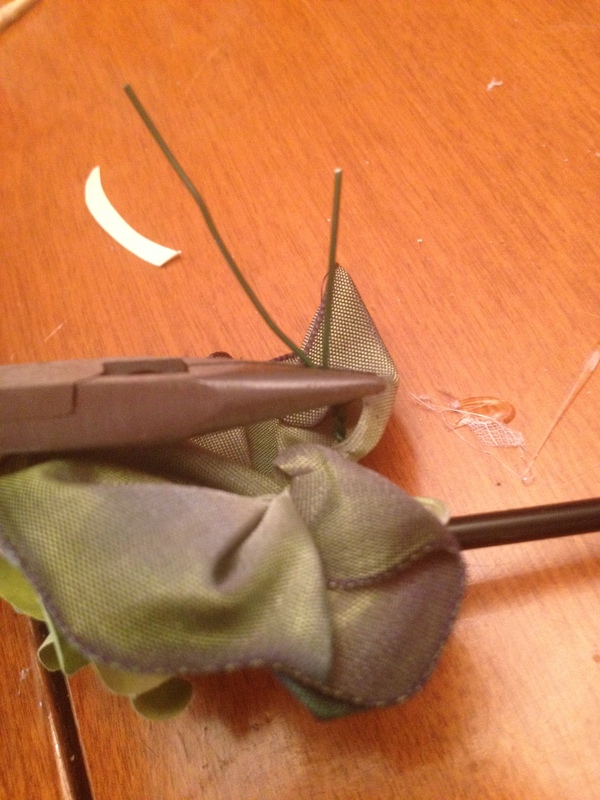 You need to sew a loose gather stitch about 1/4 up from one end. Nothing fancy here. 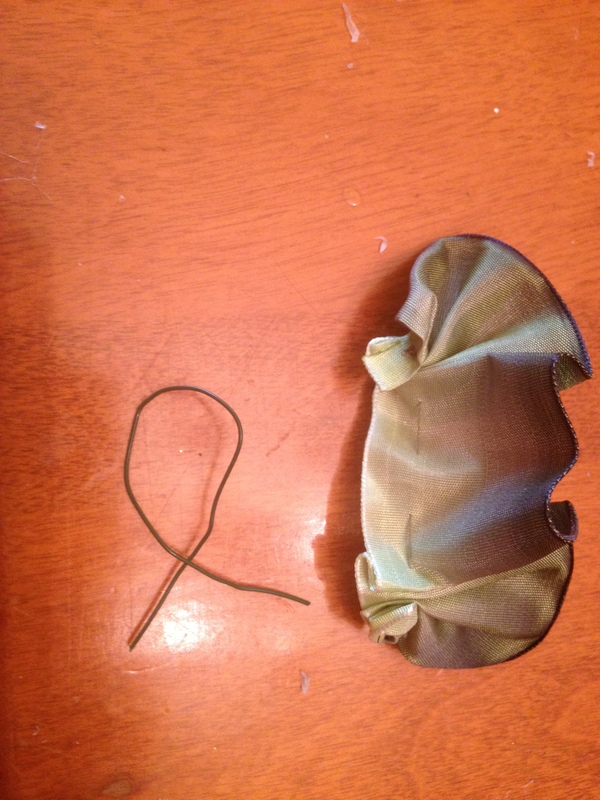 This is to just make working with the ribbon a lot easier. 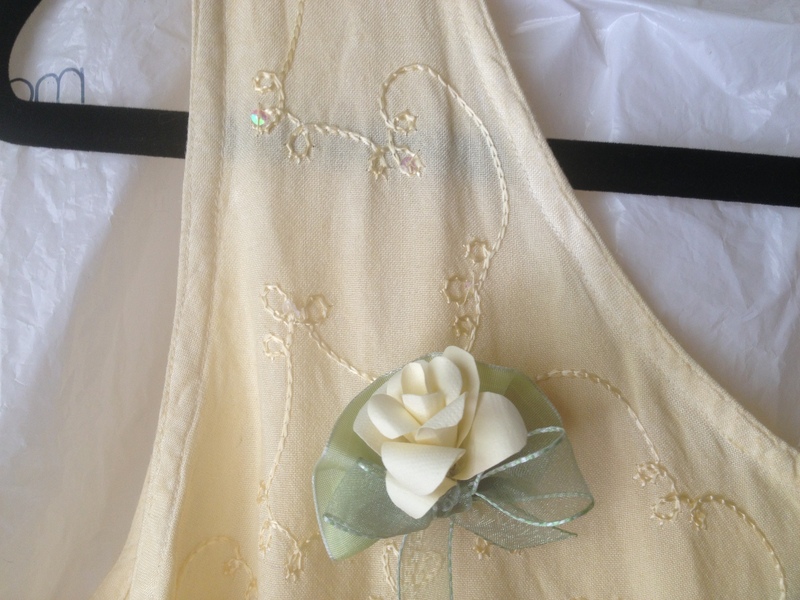 Gather the ribbon and tie off. 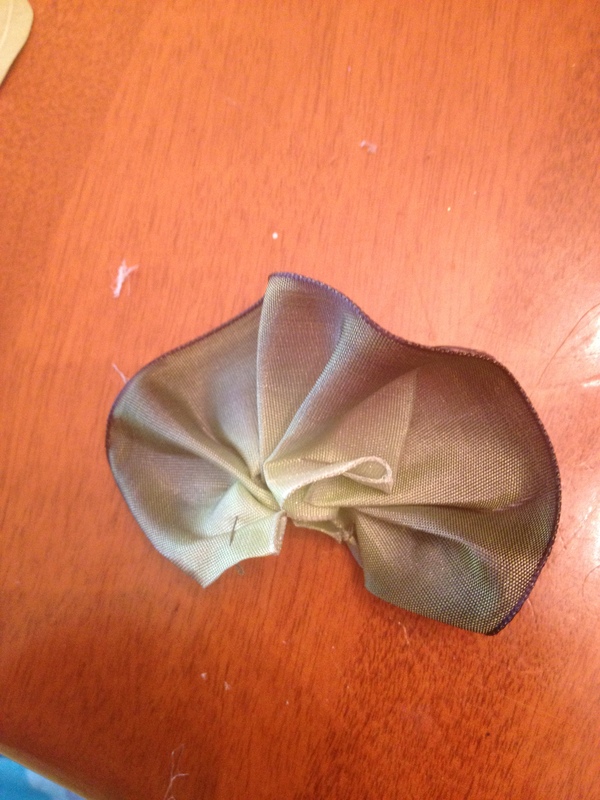 It should NOT be a tight gather/ruffle, but semi-loose. It should form a seashell shape (see pic below). 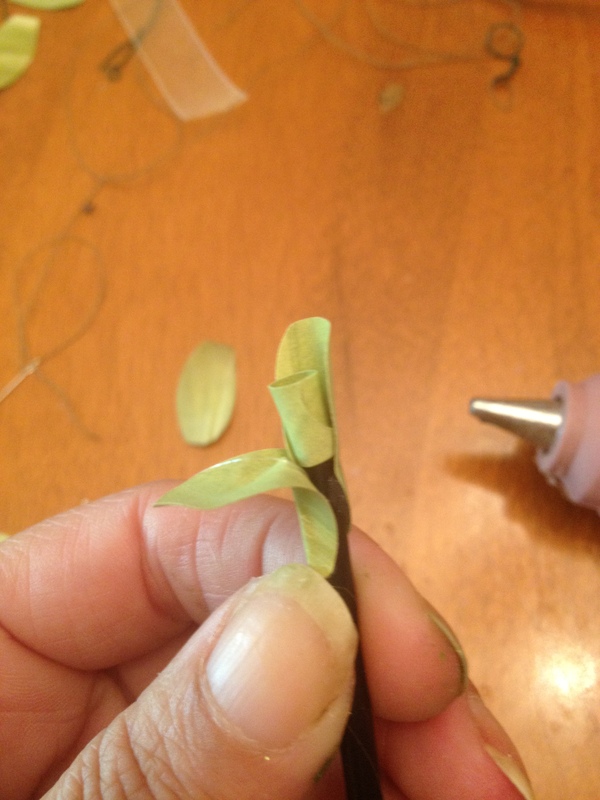 Cut a piece of floral wire and bend it into a “U” shape. (note: I have my gathered ribbon smoothed out a bit in this pic, but when evenly gathered it still looks like the picture above-sea shellish shape. Your gather should be loose enough to do this). 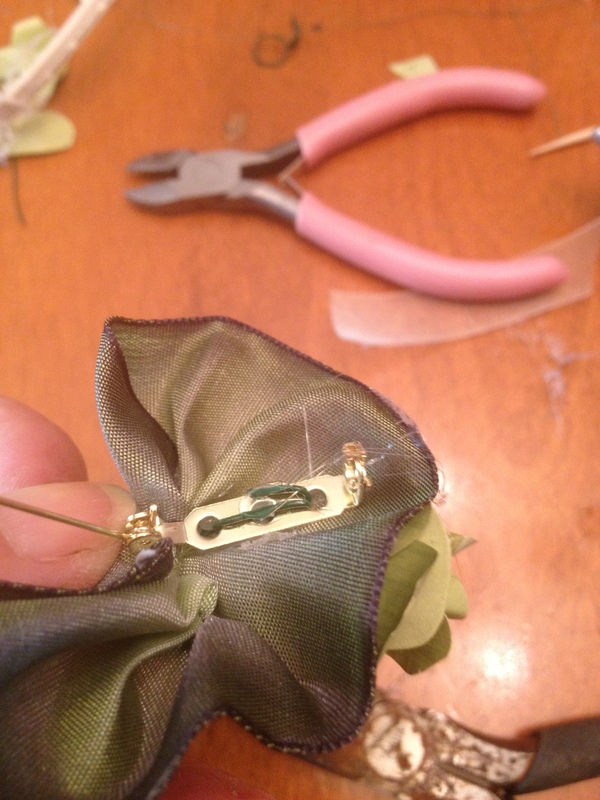 On the end with stitching, gather up the ribbon so it is even (see picture). 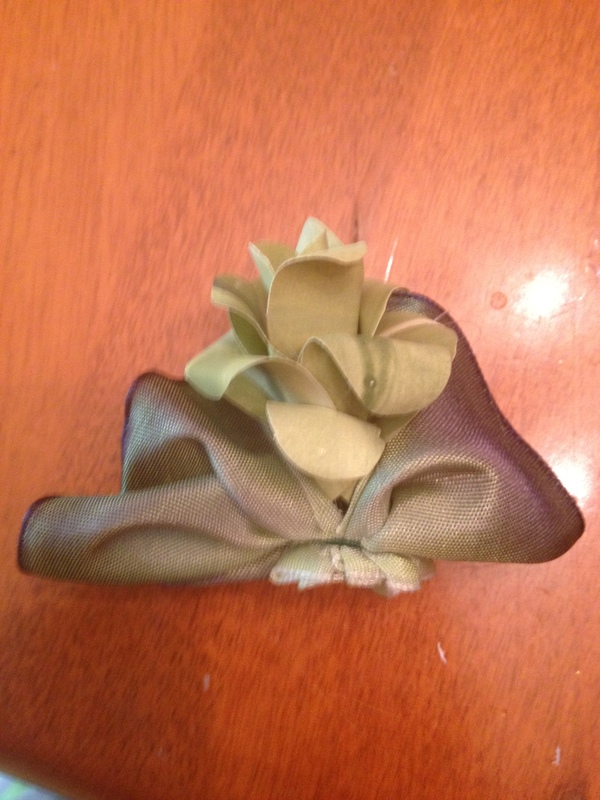 Take your wire and place it over the end of the ribbon (just about where your stitches are) and loosely twist the ends to close it. 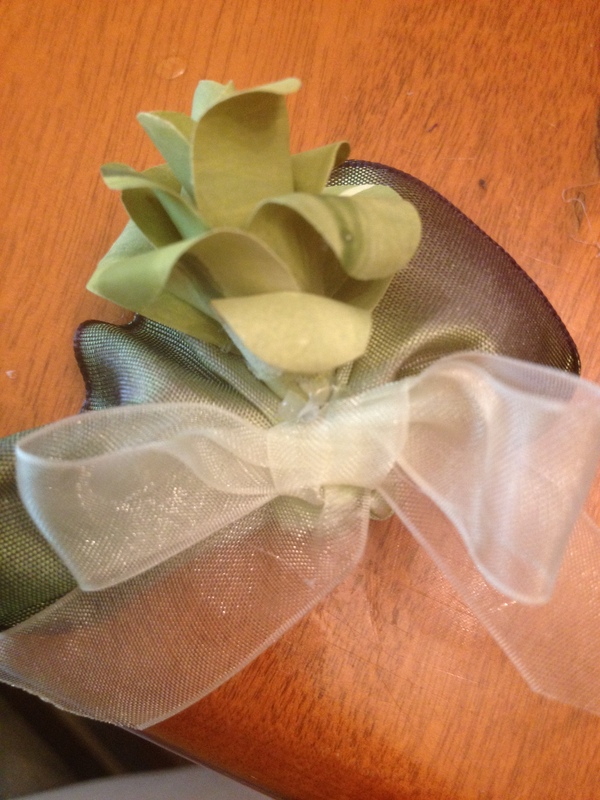 Just enough to hold the ribbon. 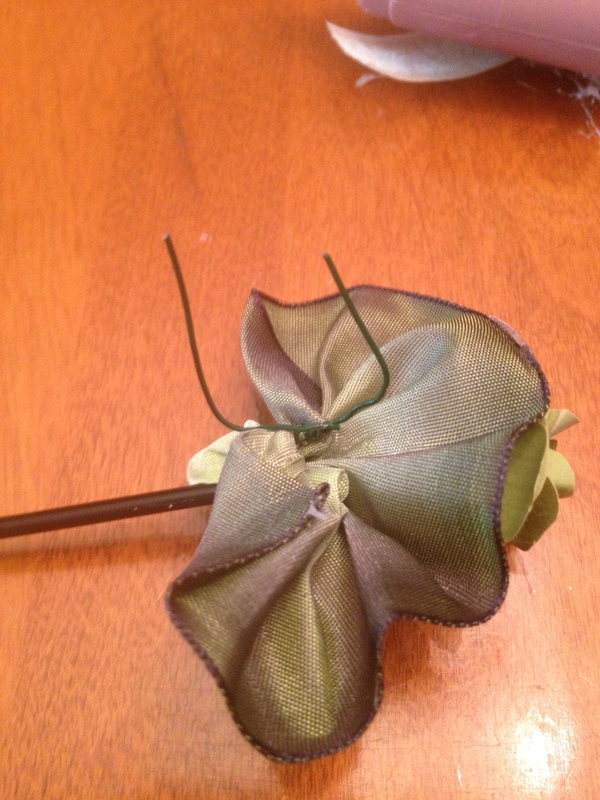 Step 3: Slide your flower on the cocktail straw down through the wire. 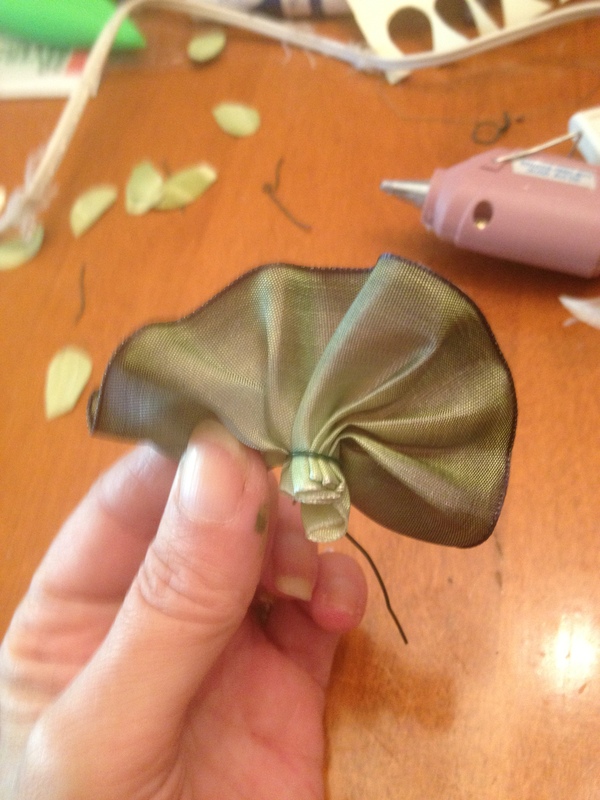 Get the flower base under the wire. 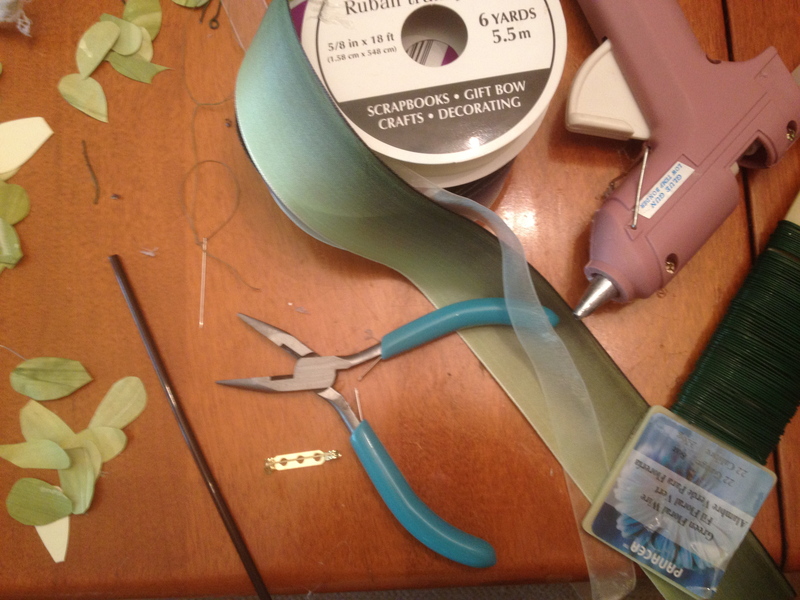 Make sure all the ribbon edge is still in the wire loop and everything is where you want it. Turn it over and twist that sucker tight. 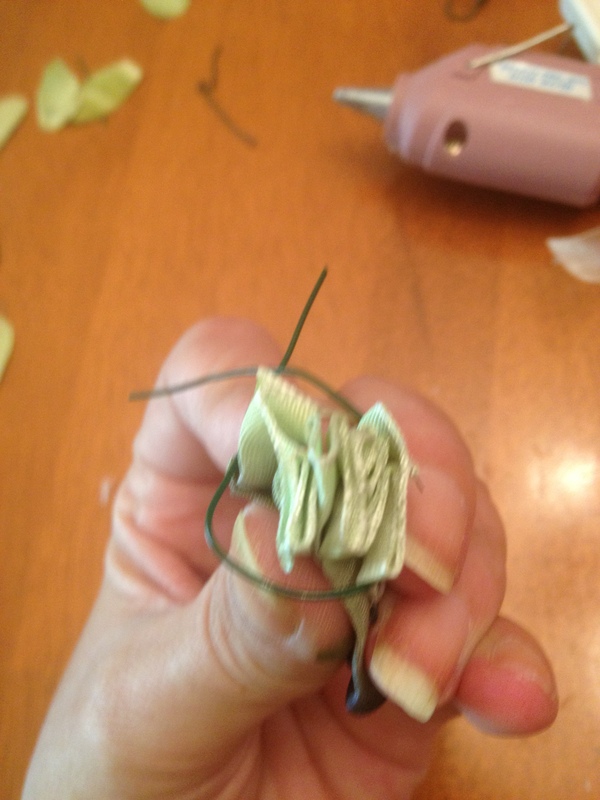 Flatten out the twisted wire so it is flush with the back of the ribbon. 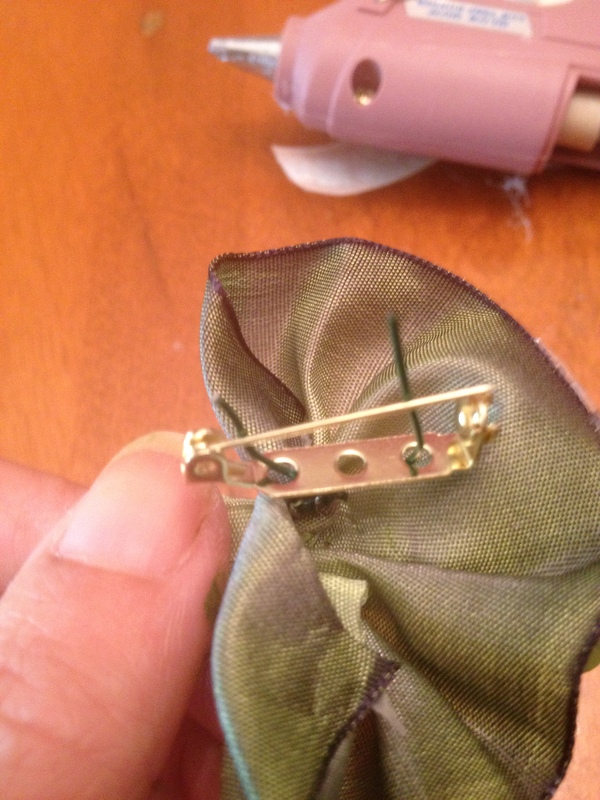 Step 4 (optional): If you are attaching a brooch finding to the back of your corsage, form a sort of “field goal” shape with your two wire ends. 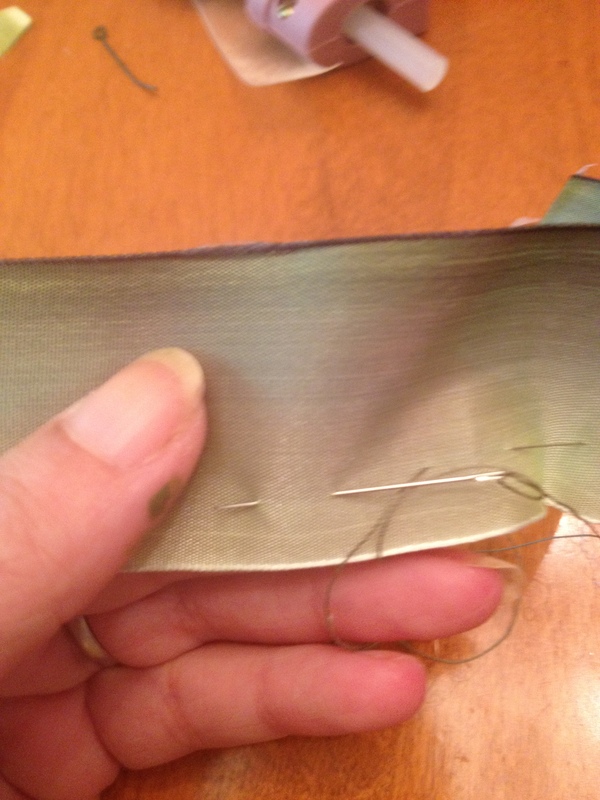 Thread your finding over the wires (see pic), put some hot glue on the ribbon where the finding will rest, and bend down the wires to hold it all together (the glue is for a little extra assuredness). 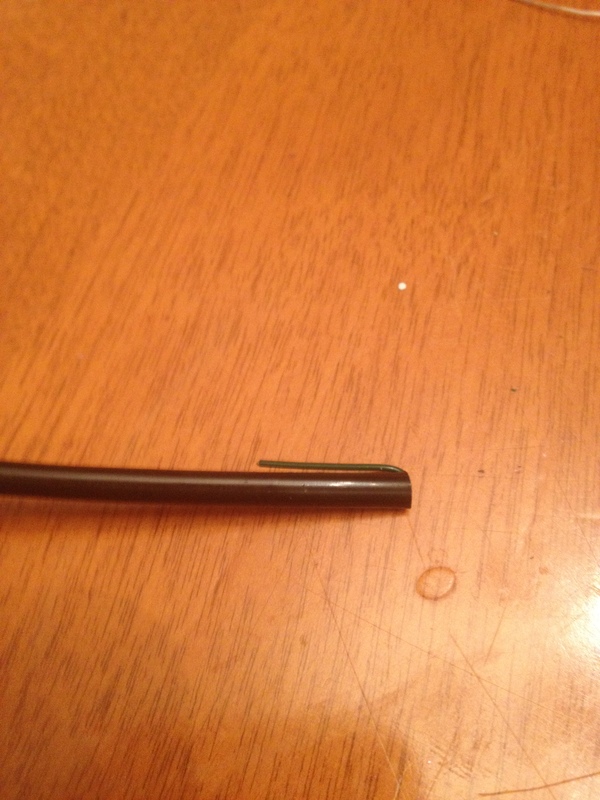 You may need to cut excess wire off of the ends before bending it down. Step 5: Time to cut that straw. The first one I made, I cut the straw right away and it really made the piece hard to work with, so be sure to cut the straw down as a last step (or close to last step). My little skewer is pointing to where to cut, but basically you don’t want the straw to show, but leave enough so that it is still under the wire. 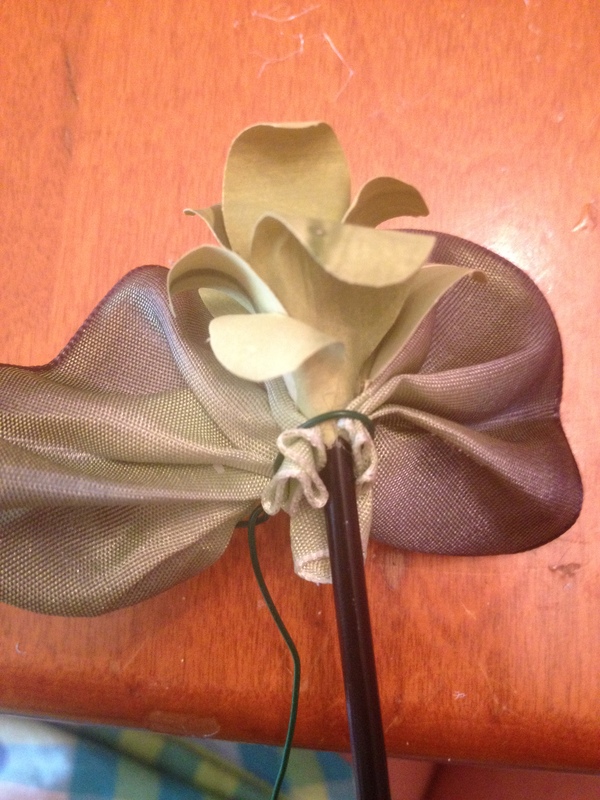 After cutting, you can pinch your ribbon together over the straw, with a little glue to hold it. 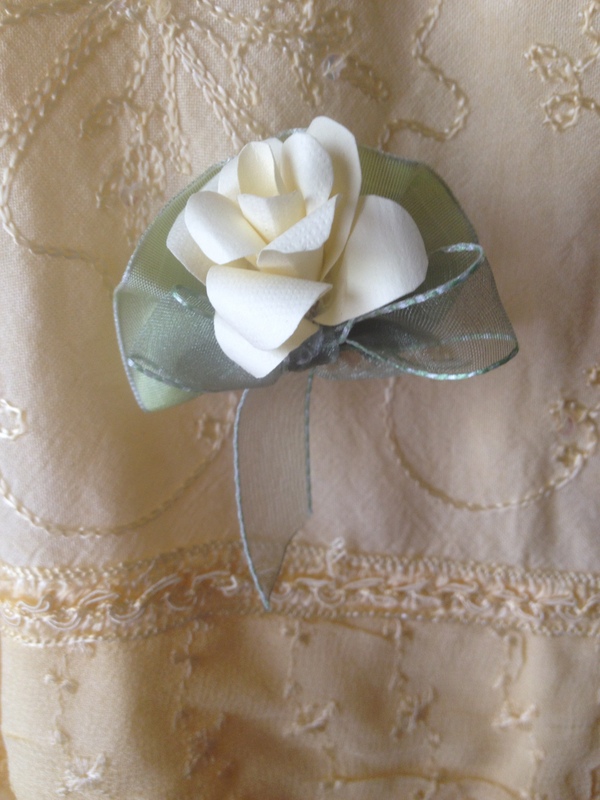 Step 6: Cover the wire with a little bow in your complimentary color (just a dab of glue to hold it on) I used a small sheer organza ribbon. 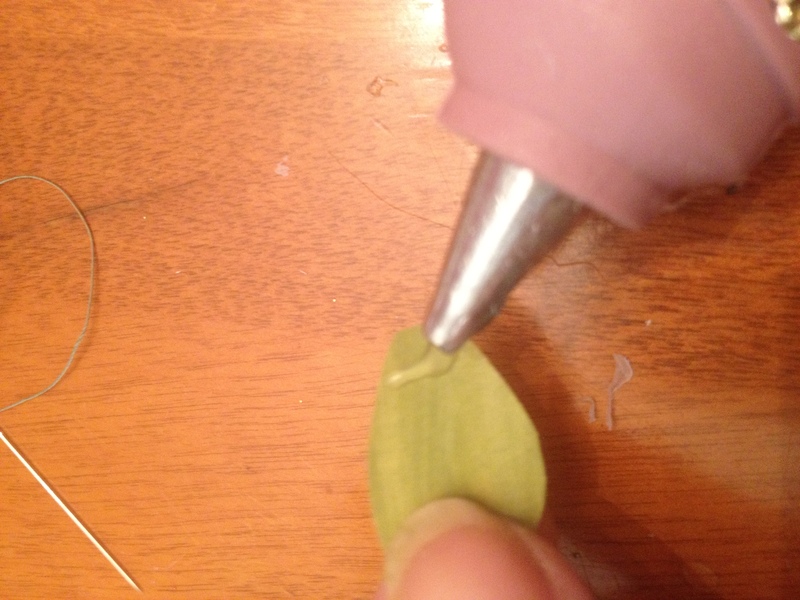 You could also glue some flatback pears or rhinestones too. 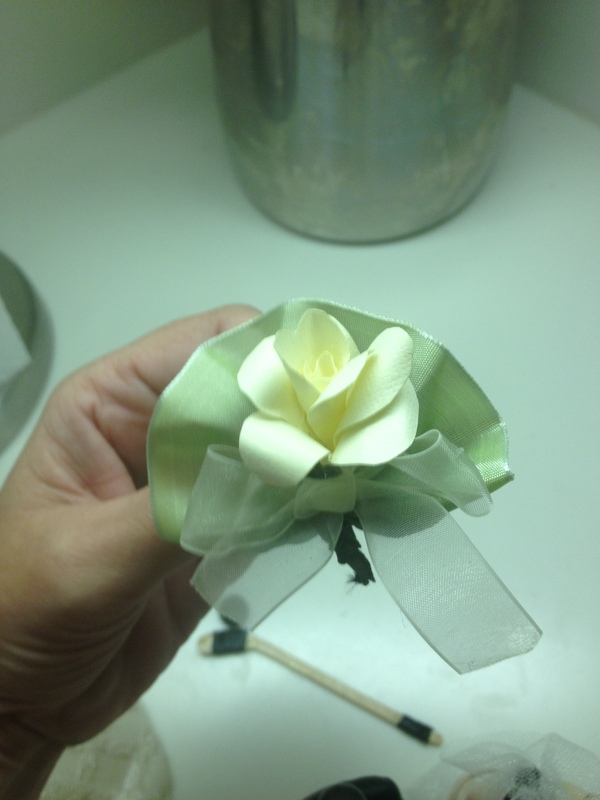 At this point I also put a little bit of glue at the top back of the flower to hold it to the top part of the ribbon. Or “bouts” for the spelling challenged (like me). and my fiance thought they would make nice bouts. Always looking to do things in advance (and save a few dollars too), I happily agreed. I was happy with how easy they were to make. 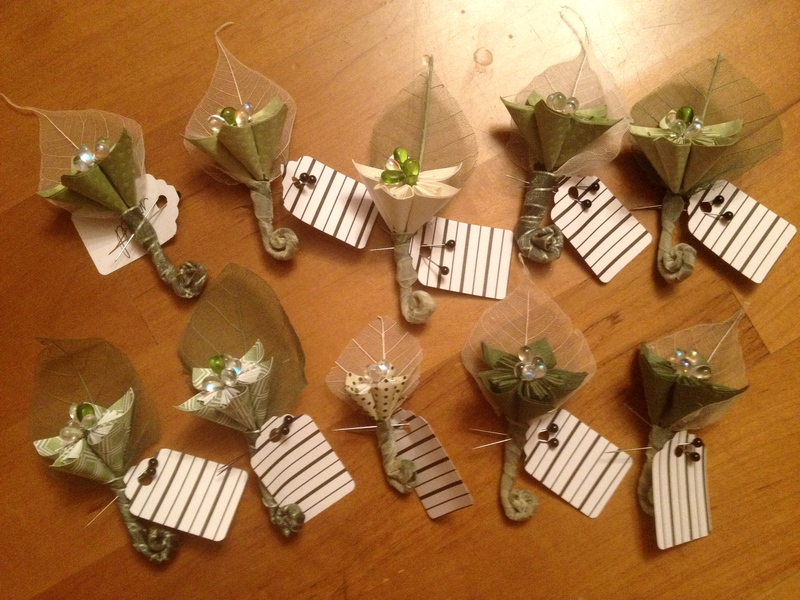 Just a few hours for all ten, and that included making the flowers. The cost is under a dollar for each one–if you have to purchase everything. It is less than that if you already have a few supplies on hand. Also, I think they look great. 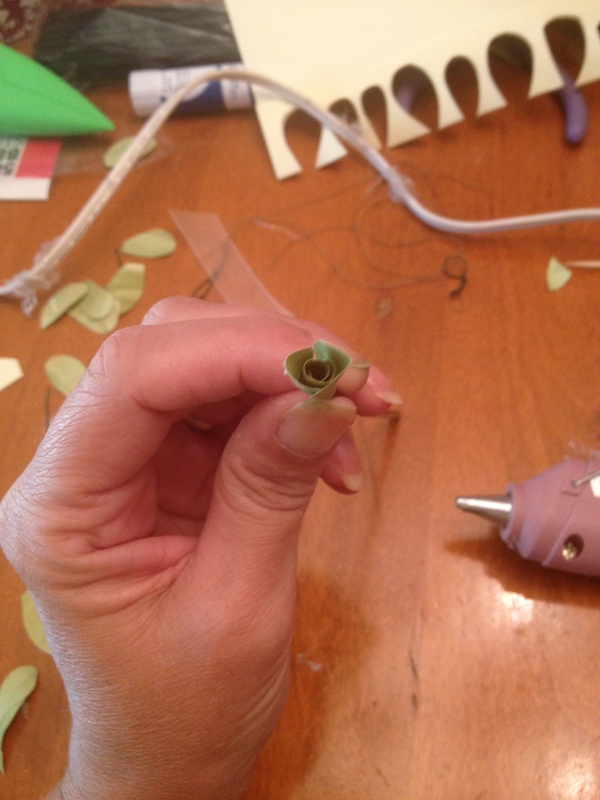 Floral wire: 18 gauge for the “stem” of the bout. Kusudama flowers (for a how to on making these, click here). 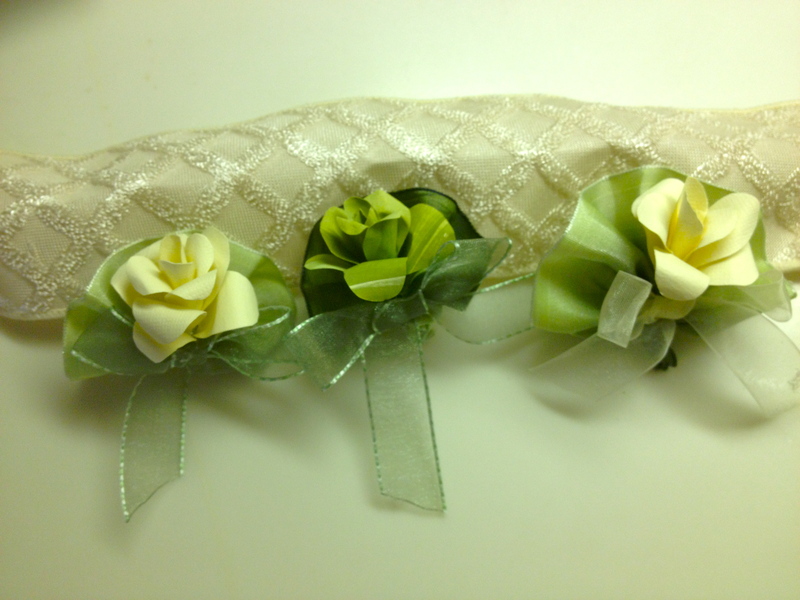 I used 2″ squares to make mine, except for the ring bearer’s bout–I used 1.5″. 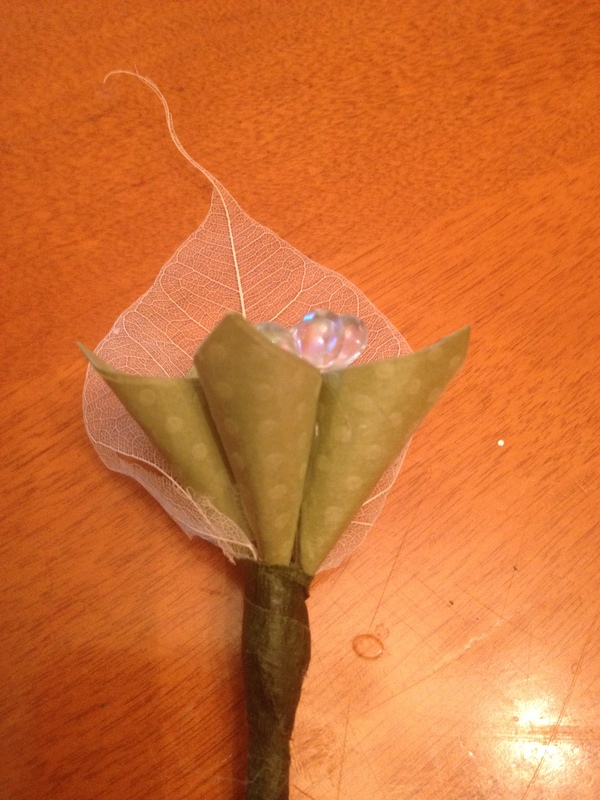 Assuming you already have the flower made, you’ll need to string your beads for the center of your flower. 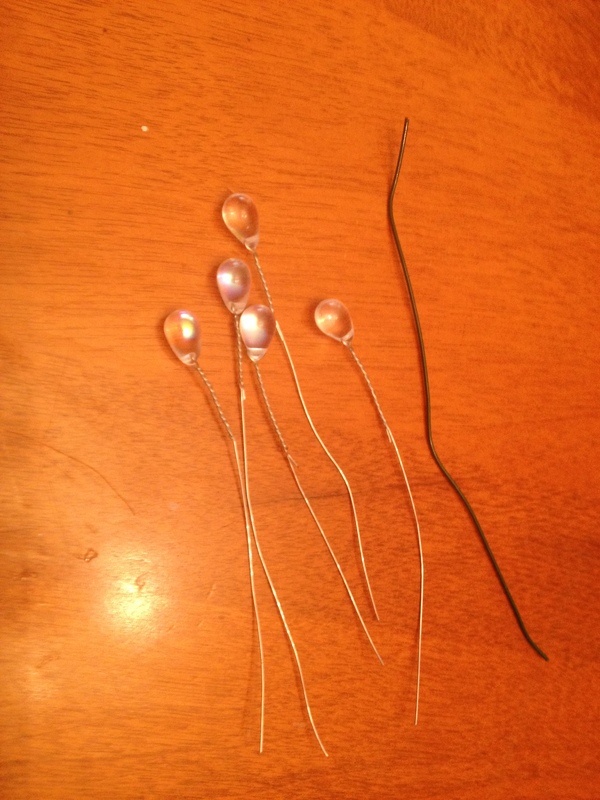 I chose these glass teardrop beads and thought five of them in the center looked nice. 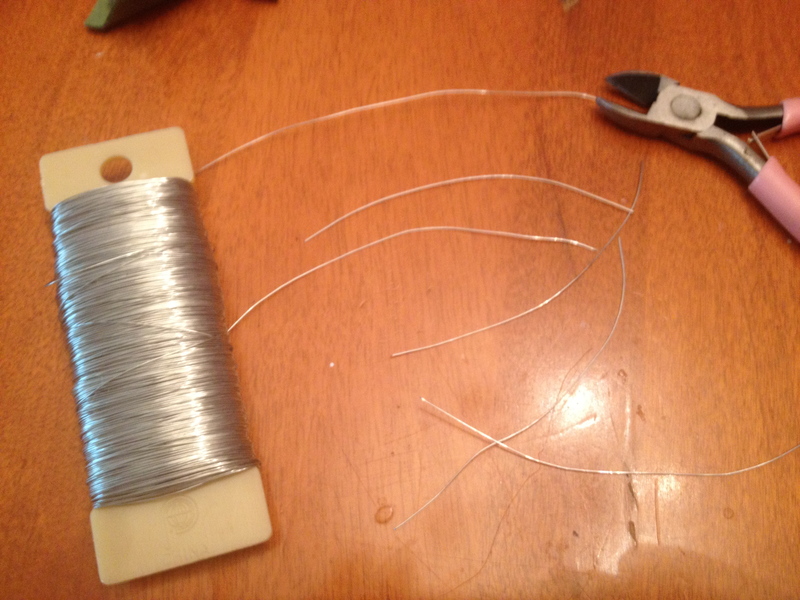 Cut your jewelry wire about 2-3″ long. 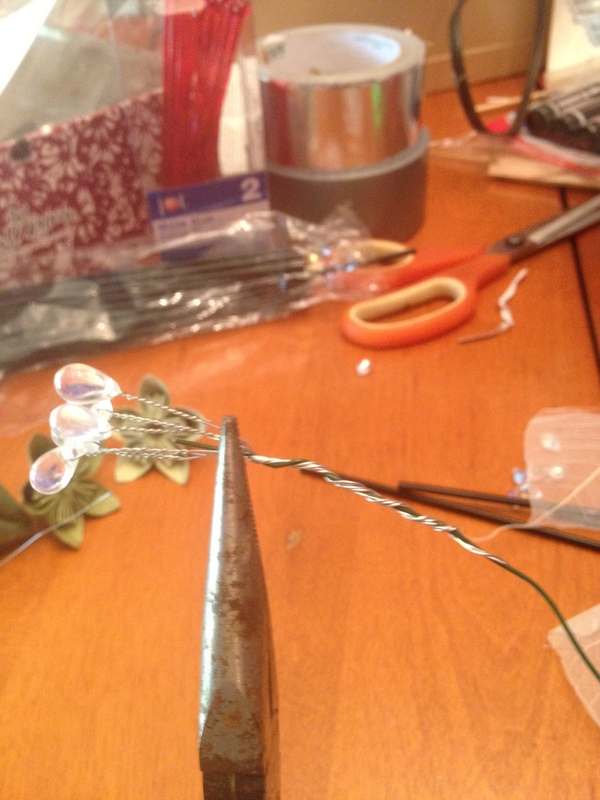 You’ll need one wire for each bead. 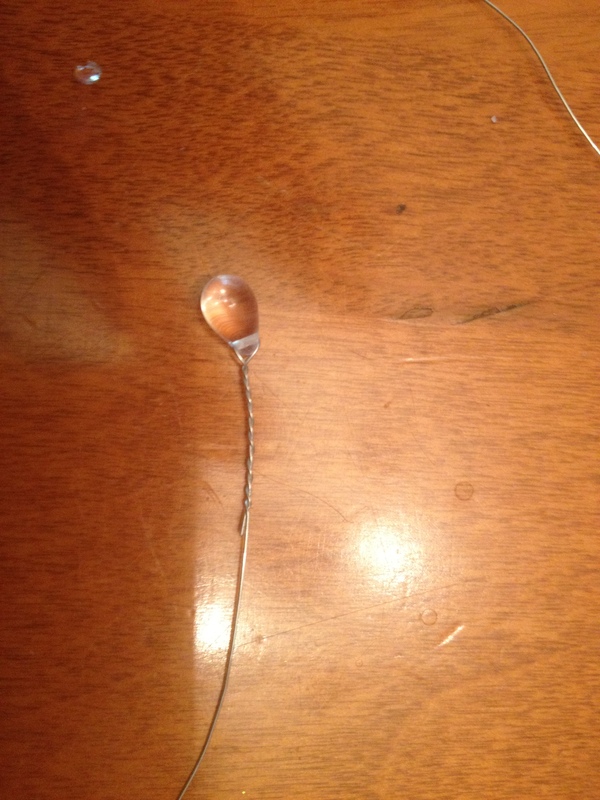 Thread the wire through the bead and bend over about an inch and twist your wire tightly to hold the bead. Do this for each bead. Grab all five of the wired beads and keeping them even on top, twist the wires so they are all connected together. 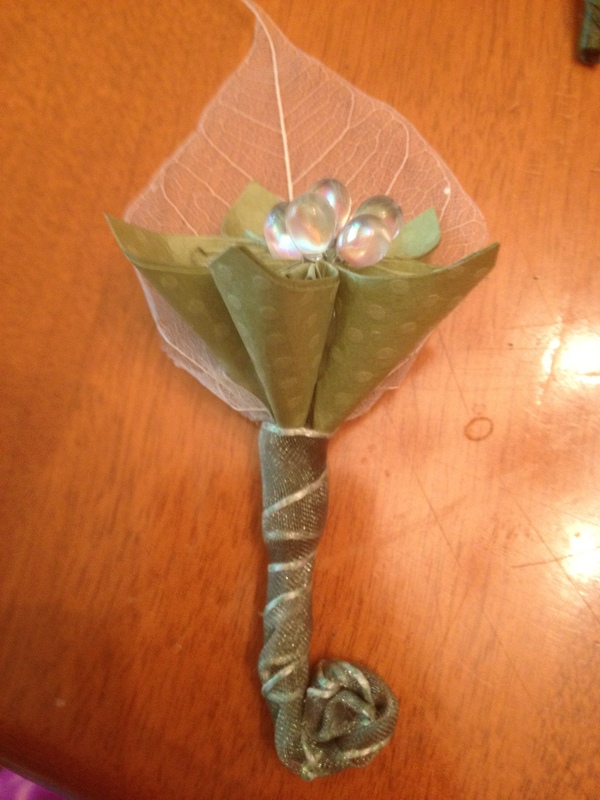 You’ll then want to twist in a 18 gauge floral wire. 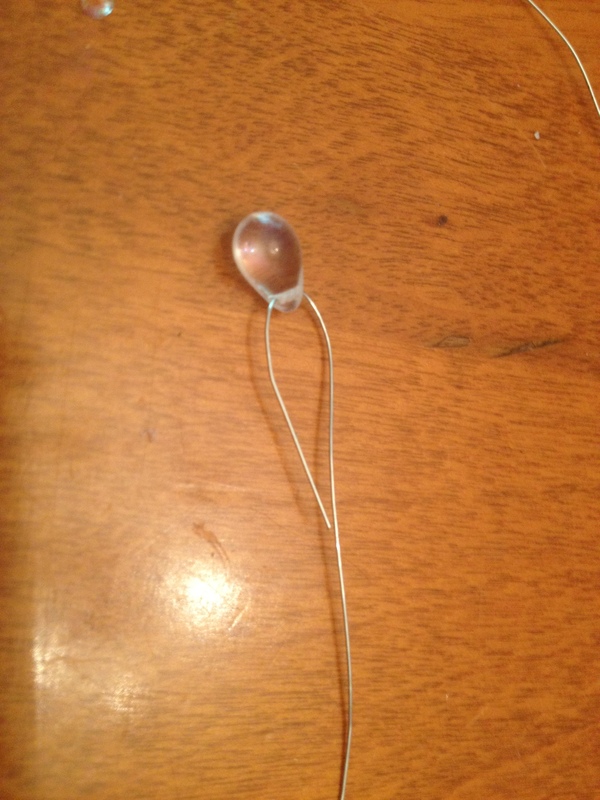 The floral wire will be your stem. 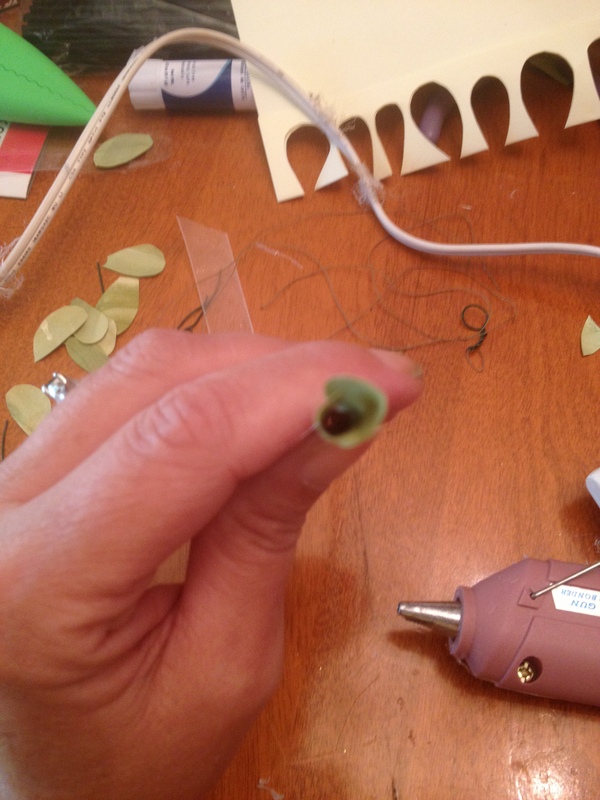 The beading wire is just not strong enough on its own. 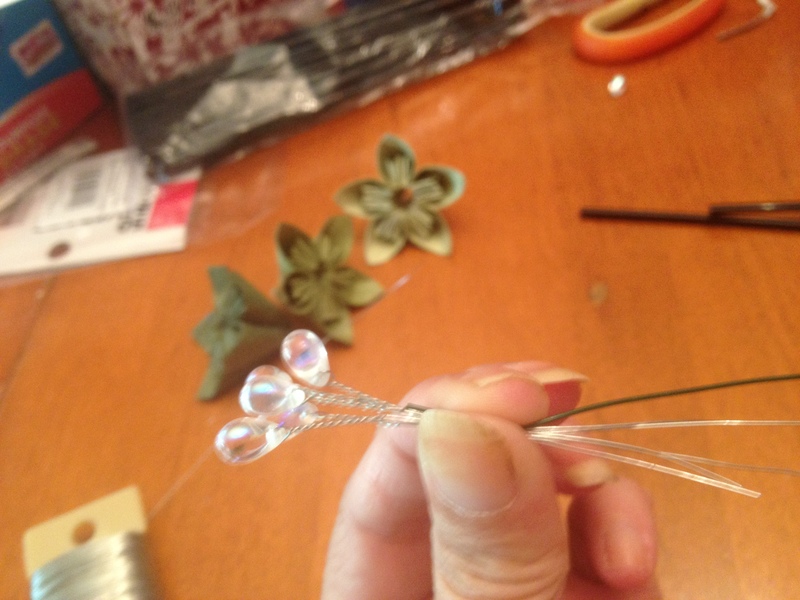 With the beaded wire and floral wire all twisted with one another, thread these through the center opening of your flower. Cut your cocktail straw down to the desired size. 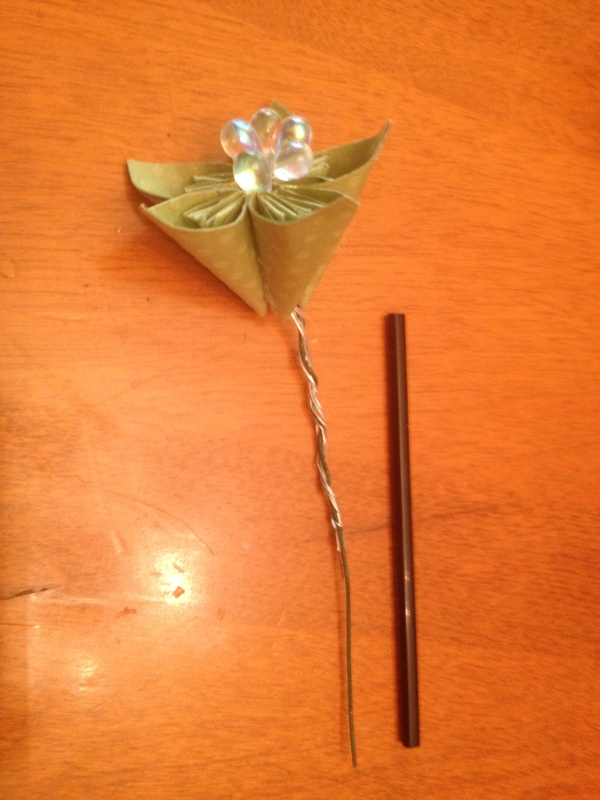 The cut straw needs to be a tad shorter than the floral wire on the flower (see picture). 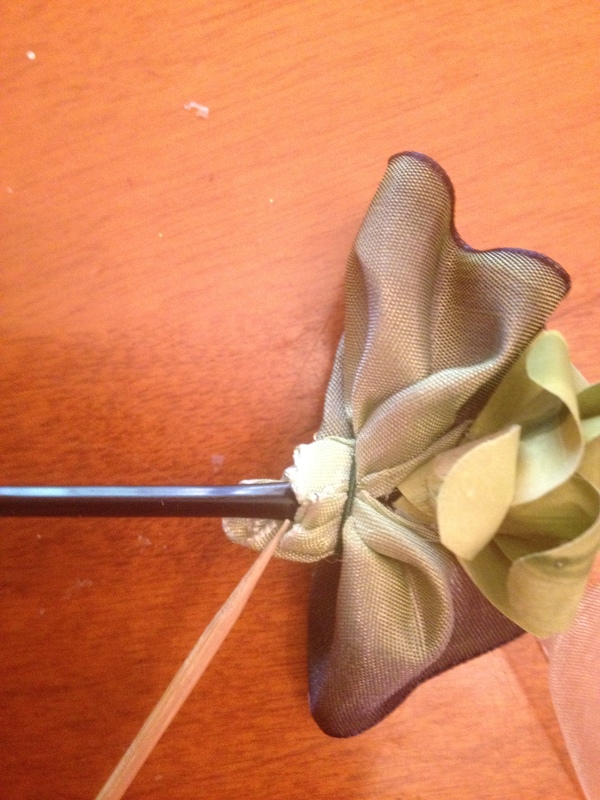 The straw will serve to thicken up the stem of your bout and give the tape/ribbon something to cling to. Thread the wires through the straw. 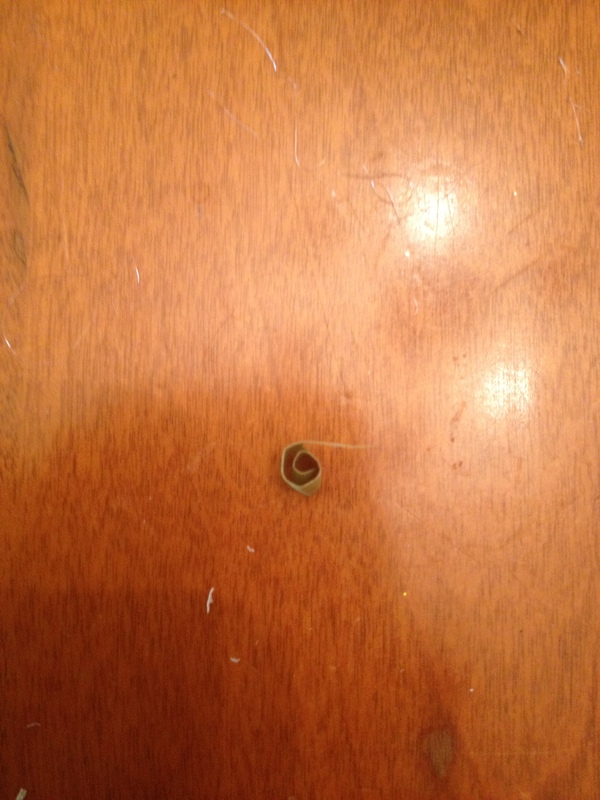 You should have some floral wire sticking out of the end of the straw. Bend it up over the straw. This will hold everything nice and tight. 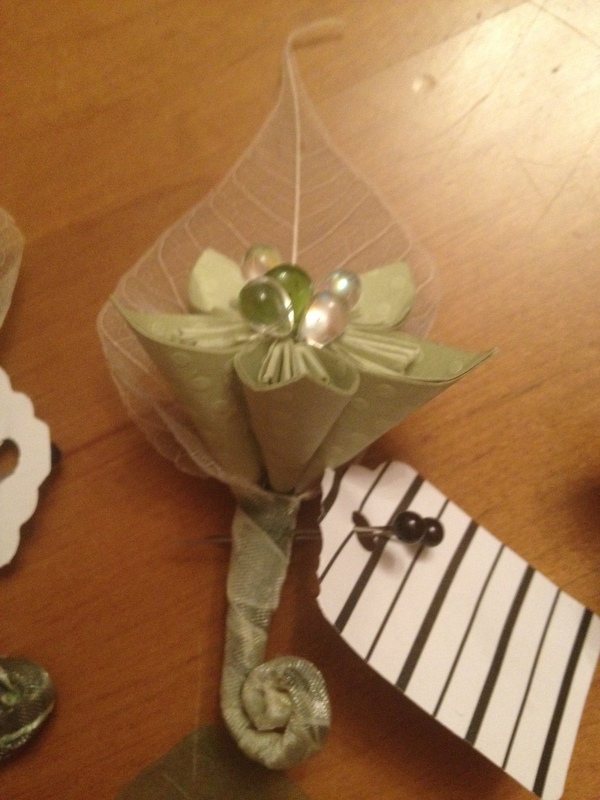 You may want to put a touch of glue at the base of the flower where it meets the stem for added stayputtedness (not a real word). 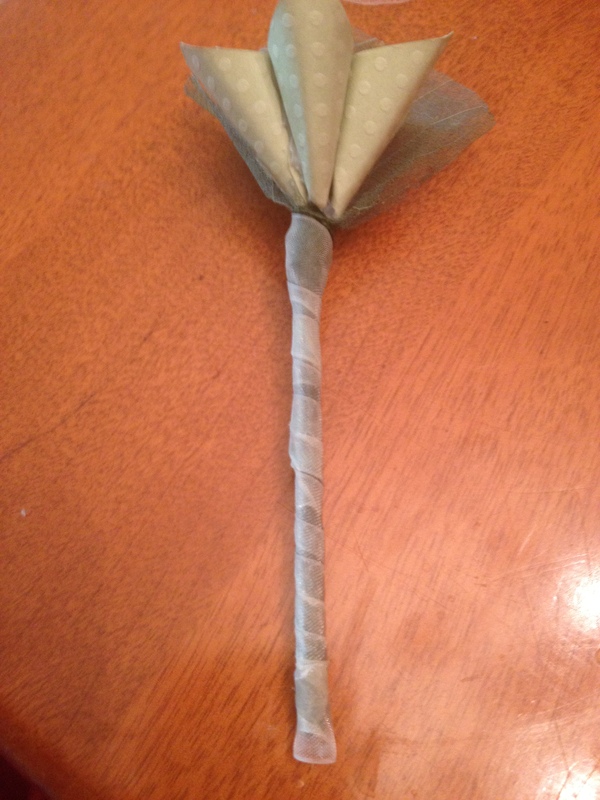 At this point, you wrap the stem in floral tape (or whatever tape you choose), just be sure to wrap tightly around the base of the flower and get all the way to the bottom of the stem. 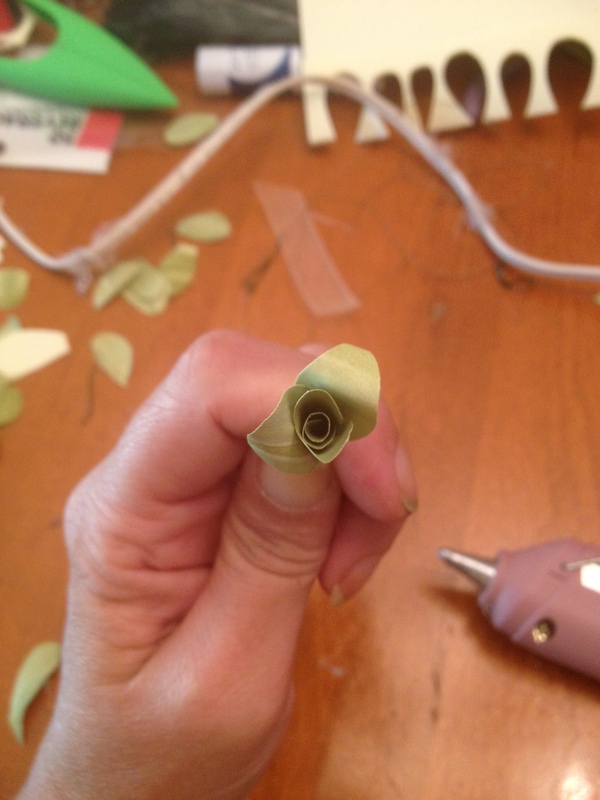 With floral tape, I have to do in two parts. 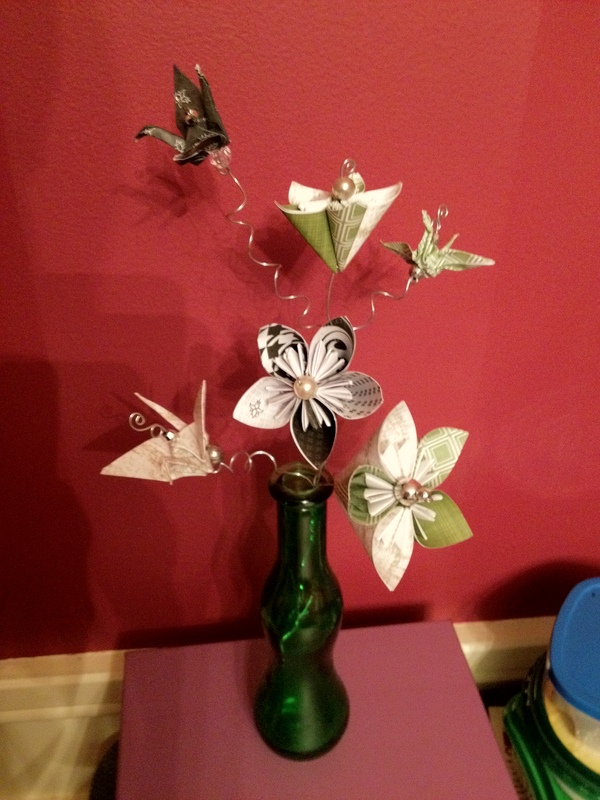 I use about a 5″ section to wrap just the base, and then another 5″ piece to do the rest. 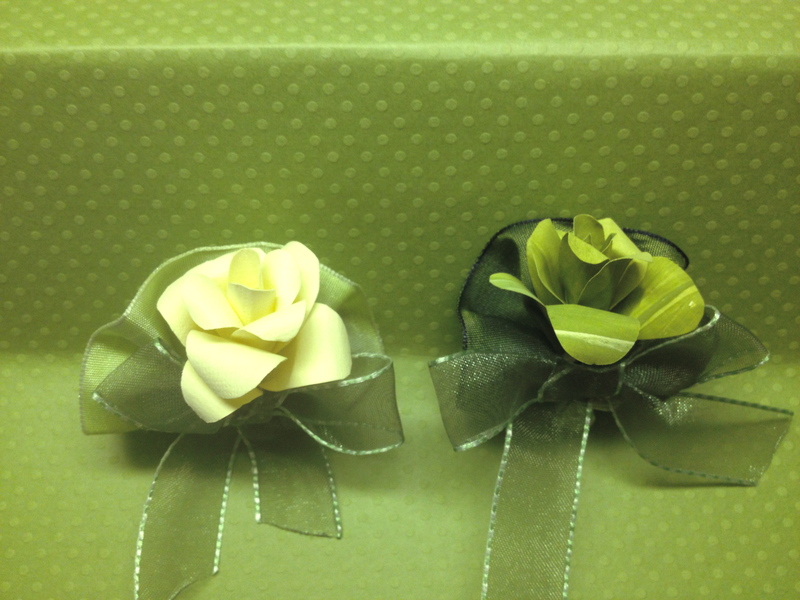 If you are as bad as me with floral tape, you can wrap the whole thing in ribbon when you are done and the tape will not show. There are lots of things one can use as a background for their flower. I found these leaves taking up space in my craft room. 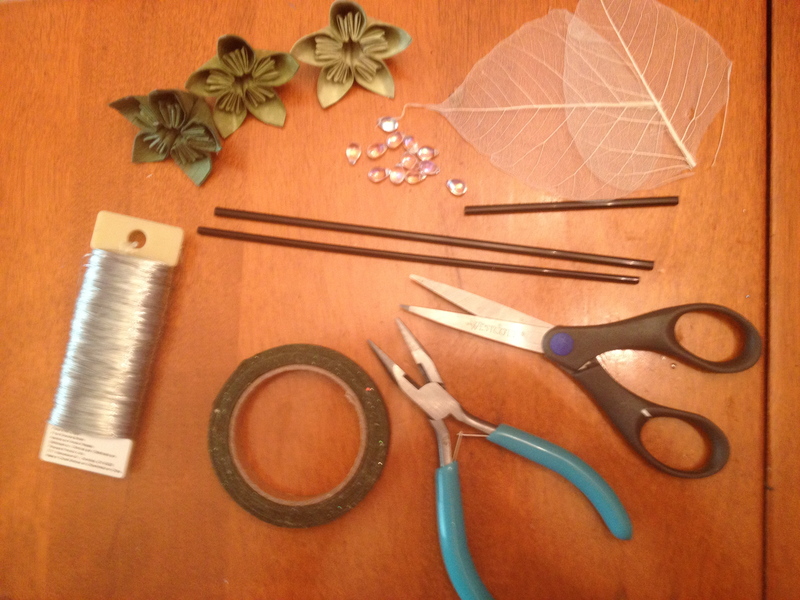 If I didn’t have them, I probably would have cut a circle of tulle, or stole a leaf from a plastic plant, or even made one out of paper. Lay your flower and center it on your background piece. Secure it with floral tape. 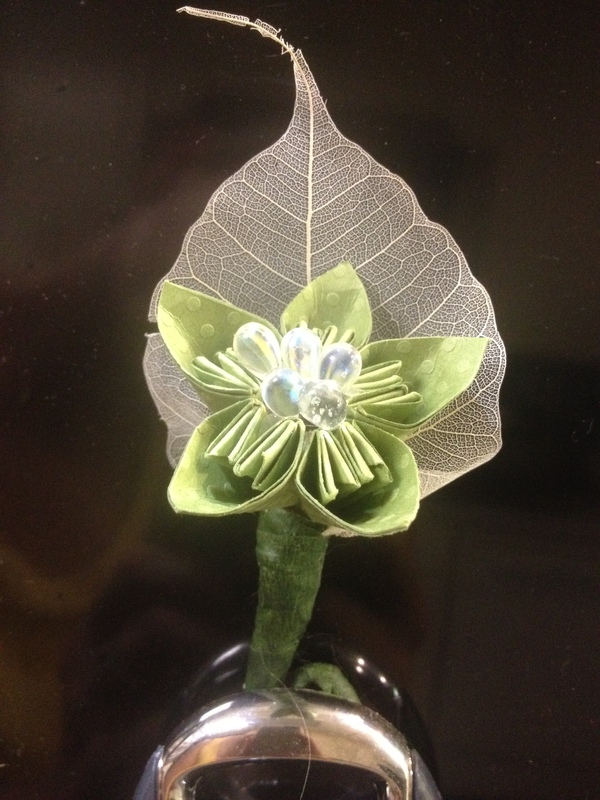 Since my leaf was bigger than the base of the flower, I just pinched it in on both sides and then wrapped with tape. 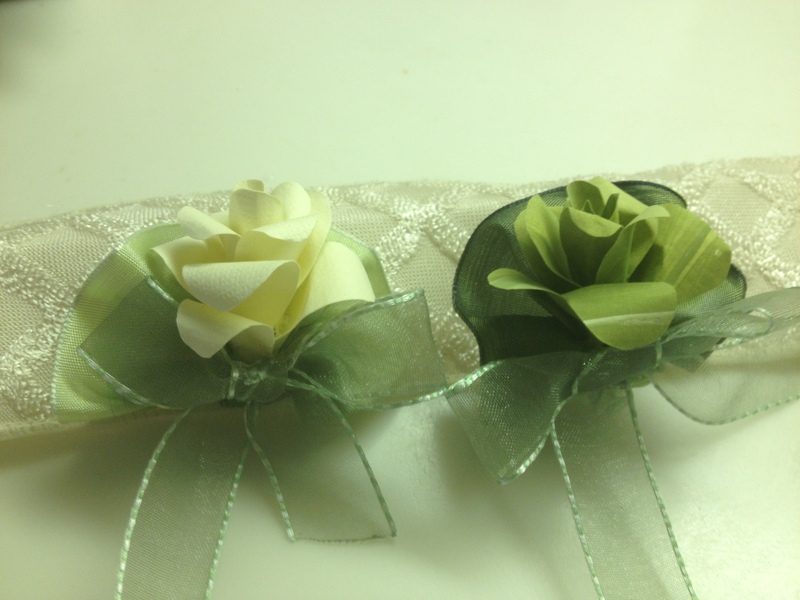 Since floral tape is sticky and I have cats, I finished off the stems with organza ribbon to prevent the bouts from being cat hair magnets. 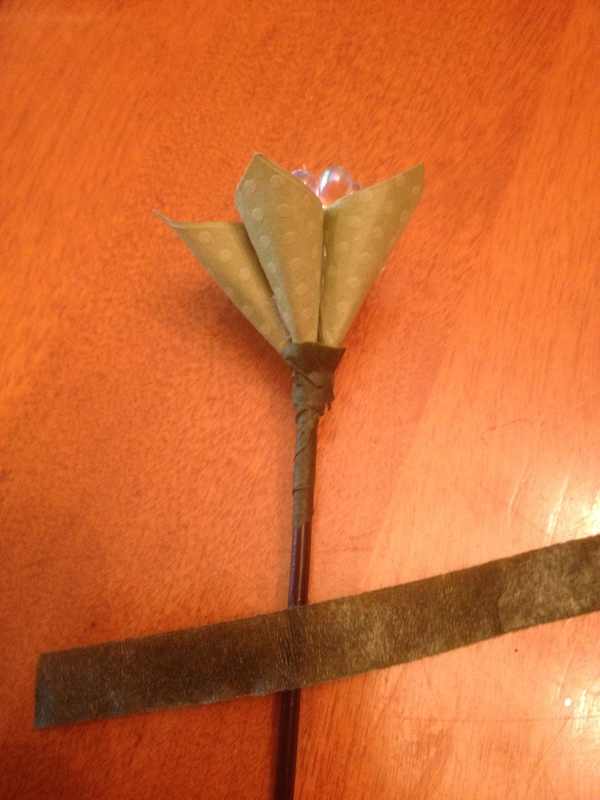 I just placed a dot of hot glue on the back of the bout (where the flower meets the stem) and wrapped all the way to the bottom. 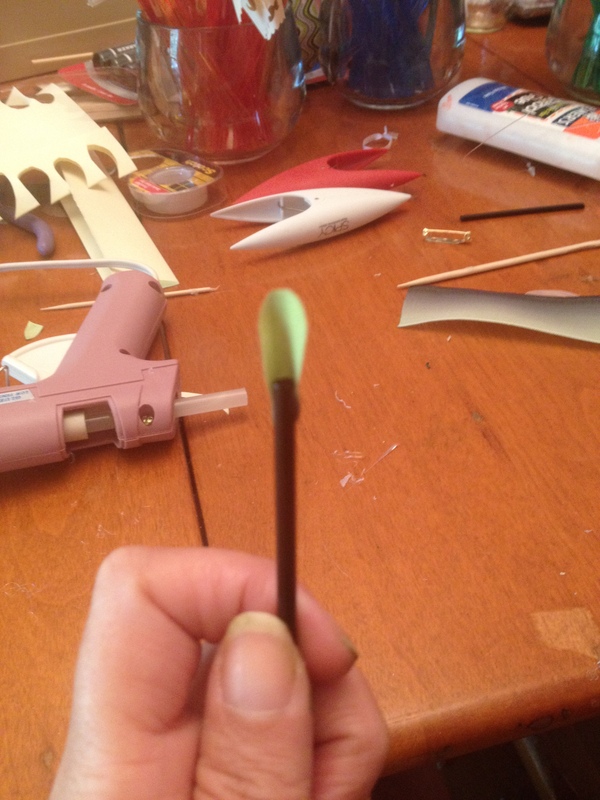 A spot of hot glue on the tip of the end held the ribbon in place. 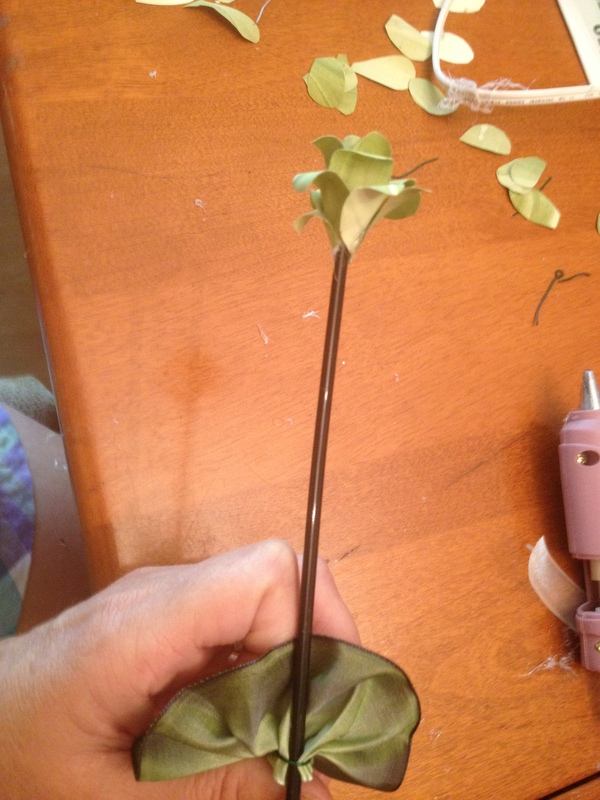 I used a pair of small pliers to curl the stem of the bout as well.